They did it with Jane Austen and called it Mean Girls and it’s still an iconic movie. 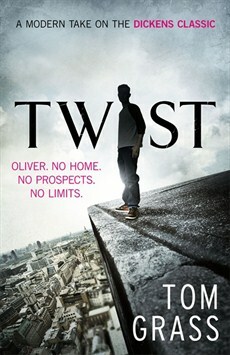 I have news for you Twist is terrific stuff. Fast and gritty from the get go we first meet Harry – a fast moving thief who is betrayed by Fagin’s gang. If you don’t have trust of your fellow thief you have nothing. Harry is going to meet his end and now the gang is without an ‘artist’. Enter Red, the beautiful foster girl who ditched her ‘family’ for the security of Fagin (FBoss) and Bill Sikes, who keep her sweet with cash when she needs it. She’s the lynchpin in the operation, the key to every hustle or steal. FBoss and his cohorts live in a listed warehouse that can’t be demolished – secure they will never be found by the police or any other criminals who might want a share of their spoils. Their specialism is stealing artworks and they are audacious and daring in their heists. It’s Dodge who discovers Twist, the graffiti artist extraordinaire, who recreates master works on city walls. Agile, brilliant and self taught; he’s a loner – hiding away in a desolate empty tower block where he is recreating The Matador from memory. Everyone knows about his ‘work’ on the walls of the Tate Britain. FBoss wants him. Needs him. Dodge sets it up and Red is there to reel him in when he’s ready. It’s cold and calculating. All the boys fall for Red and vulnerable loners are putty in her hands. But Red is in deep debt to Bill Sikes. A matter of natural curiosity getting her into major trouble with Russian gangsters. She owes Bill big and Twist is going to end up with a broken heart for sure. Bill is very possessive over ‘his’ girl. The story moves like the most exciting teen movie ever and you can’t read it fast enough to catch up with all the events, the schemes plays and counter plays. Twist is caught in the trap and has to fall in with them. Even grow to admire their skills and the strong bonds between each other. But all he wants is a big score so he can go study art somewhere. He discovers that Red is secretly the same – dreaming a career in dance that probably will never happen. Escaping Fagin’s clutches would be hard. Each character comes alive in this vivid reinvention and it never slows for a second. You will be rooting for Red and Twist as they make things happen and prepare the ground for the most amazing art theft ever. London comes alive and it’s crawling with opportunists and very skilful thieves. Tom Grass constantly raises the stakes for Twist and the gang who discover that they are not just playing for the money – but their very lives. The hustle can be lethal. Twist is electrifying, thrilling action that will keep you on your toes from the very first page.